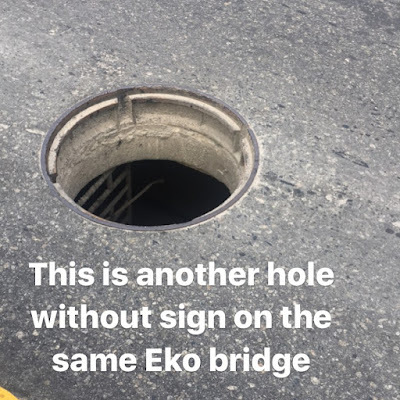 Nigerian musician, Lamboginny, took to his Instagram page to raise alarm over the presence of Major holes on the Eko bridge in Lagos! 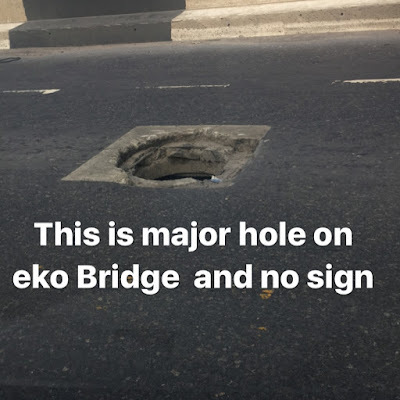 Pls Let Me Dance To That Yoruba Noisemaker's Noise '...and If U See Huge Dangerous Death-trap Holes In Lagos Bridges, U Go Like Lagos O!And If U Die When These Bridges Fall On U,u Go Like Lagos O! 'ooh La Lah, I'm Dancing A Dance Of Hopeful Hopelessness Over These Bridges.So Hopeless,dangerously Hopeless! It is a manhole with manhole metal cover for access or control measure. I think someone remove and stole the the metal cover to live it open.